Making crepes for a crowd? You can stick the crepes on a plate in a barely warm (200°F) oven, where they’ll stay warm until you are ready to assemble them. Or you can serve them as you make them. With anxious children in the kitchen, crepes will be eaten right off the pan. Also, if the crepes have cooled, a warm filling will hide a cooled crepe. The easiest way to mix crepes: get out your blender. Simply add the ingredients in order and blend for about 30 seconds. This will make your batter smooth. If the batter is lumpy, strain it through a sieve. At this point, it can also be covered and refrigerated for up to 1 day. Bring batter to room temperature before continuing with the recipe. Some batters must sit for an hour before baking. It’s worth the wait. Got holes in your crepe? While the crepe is baking, stand by with a spoon to quickly put a little batter over the hole. If you’re serving your crepes wrapped around something no one will notice the patches. When baking a crepe in a skillet and it is ready to be flipped, first loosen the edges of the crepe with a metal spatula then you can use the spatula to turn the crepe, but I usually turn it with my fingers. Using both hands, I pick up the loosened edges with my thumb and index finger and quickly flip it over. 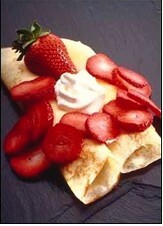 Crepe Storage: Crepes may be kept tightly wrapped for up to 3 days in the refrigerator. They can also be frozen. Simply stack crepes alternating each with two layers of waxed paper. Place entire stack in a good freezer bag. Freeze for up to 4 months. Let frozen crepes thaw at room temperature for about an hour. Make sure that the crepes have come up to room temperature before using. To reheat: Heat a skillet and brush it with a little butter then heat the crepe gently on both sides. Enjoy!